This webinar was facilitated by Dewey Howard, who is the CFO of The Institute for Community Living. Billing and collections ensure that the agency receives cash reimbursements for the services provided, which is essential to meet payroll and pay for electricity. 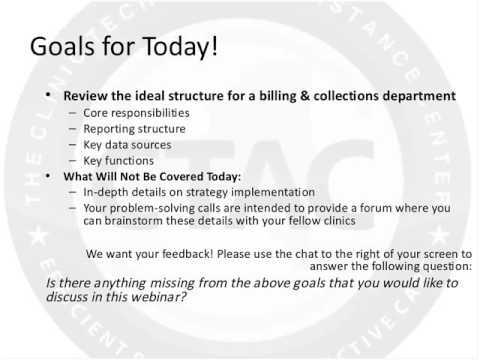 Howard discussed the key elements of what a billing department should have, including Department Responsibilities, Department Structure, Communication Systems, Regular Monitoring, Addressing Billing Errors and Benchmarking Outcomes. For example, an effective billing communication system involves ongoing contact between the billing department and software vendors, clinic staff, the larger finance department, in addition to all staff and clinicians at the agency through the use of efficient communication mechanisms such as automatic alerts and e-mails. To regularly monitor progress, the department should also have a checklist of everything that has occurred. Indicators to track and benchmark include the following metrics: amount billed, amount billed by payer, amount collected, average rate billed, amount not accepted by insurance companies, amount to write off, amount paid and amount denied.